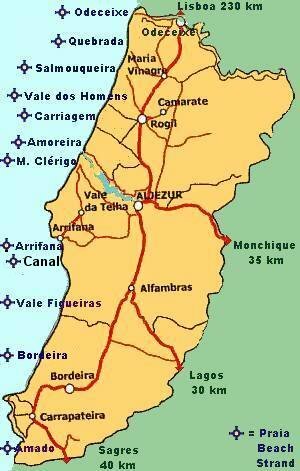 The holiday house / Western Algarve (256 m²) is located on a ground measuring 1500 m². It is situated in a very quiet place in Vale da Telha/Arrifana above a rocky coast and beaches namely Arrifana and Amoreira. The garden is cared for with a panoramic view over the protected area and above the sea. The house is in perfect condition. It has a mezzanine with a small living room. The ground floor includes: 2 bedrooms with 2 single beds, 1 bedroom with double bed (all the bedrooms have their own bathrooms), 1 kitchen, 1 small toilet, a big combined sitting room and dining room, with fire place, TV, CD-player, 1 of the bed rooms has its own balcony. There is also a large balcony with a barbecue, with a magnificent view towards the sea. In the kitchen you can find a dishwasher, a microwave oven and a coffee machine. The rental prices are valid for 6 people. Minimum stay: 1 week, i.e. 7 nights. Deposit for reservation 50% of the total price. The price includes end cleaning, linen and towels. Check-in and check-out always on Saturdays. To let during the winter: Firewood and gas are not included in the price. No pets permitted. Non smoker holiday house.